Bilateral symmetry has evolved from radial symmetry in several floral lineages, and multiple hypotheses have been proposed to account for the success of this floral plan. One of these hypotheses posits that bilateral symmetry (or, more generally, a reduced number of planes of floral symmetry) allows for more precise pollen placement on pollinators. Greater precision would maximize the efficacy of pollen transfer to conspecifics, while minimizing reproductive interference amongst plant species. Despite the intuitiveness of this hypothesis, it has little experimental support. Here, we tested whether a reduction in the number of floral planes of symmetry (as in the transition from radial to bilateral symmetry) increases the potential precision of pollen placement. 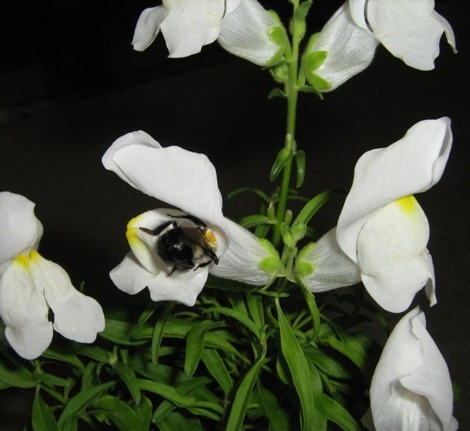 We analyzed video recordings of bumblebees (Bombus impatiens) visiting artificial flowers to determine whether consistency in flower entry angle differed between radial (round) and disymmetric (rectangular) “flowers”. We observed more consistent entry angles for disymmetric flowers than for radial flowers, with entry angles to radial flowers 43% more variable on average (standard deviations of 30° vs. 21°). Bees trained on flowers with an intermediate (square) morphology exhibited a slight, non-significant preference for radial symmetry over disymmetry. Our results show that disymmetry—an evolutionarily intermediate form of floral symmetry—has the potential to increase pollen transfer to conspecific stigmas, relative to radial symmetry. Thus, evolutionary reduction in the number of planes of floral symmetry likely provides benefits in terms of pollen delivery, as suggested by the pollen-placement-accuracy hypothesis. These findings offer insight into the evolution of floral symmetry.